As a vivid researcher and collector of German passports it gives me today a great pleasure to display the very first “Federal Republic Of Germany” passport. After WWII Germany was occupied by the Allied Forces and was divided in four sectors. During six years passports, travel permits etc were issued only by the Allied Forces Travel Board. On Feb 1, 1951 finally the power to issue passports was given to Federal Germany. However the Allied Forces still issued travel documents in Berlin only till 1968 (23 years after WWII). 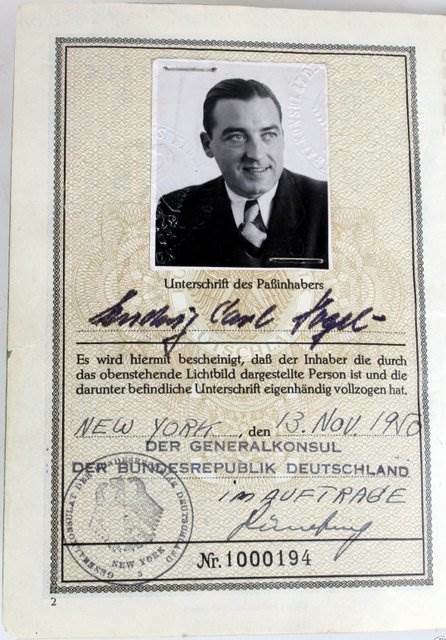 The passport as issued to a business manager from Stuttgart, Germany living in New York. 2 renewals till 1955. Several visas to Germany, France, Belgium and Switzerland. The passport number is 190/50 (while the document serial number is 1000194) so we can assume till November 1950, 190 passport were issued. Doing some research when Germany established again diplomatic relations I only could find a clear evidence of the Consulate General in London which was established on June 16, 1950. I believe mid 1950 was the earliest date when German Consulates and Embassies were established. It’s fantastic that I could grab this early document which is by my best knowledge by now the very first issued Federal Germany passport of physical existence. During my research I just found out that the US Consulate in Hamburg was just the 11th Consulate worldwide where the United States Of America established diplomatic relations with foreign nations. The Hamburg Consulate was established in 1790 and John Parish was his very first Vice-Consul. The first foreign US diplomatic mission was established 1781 in Paris. I emigrated from Kiel Germany, CCG, British Element. I am poring over old documents and I have a travel passenger roster with number #A10062634. Is this a 1953 Deutsche Reisepass number? I am trying to retrieve copies from Koeln of my original documents. Please advise. Hello Joerg. Yes, it seems to be the passport template number. In the best case you would find a copy or records of the passport application, not a copy of the passport itself. If you know where the passport was issued then you could try to get in touch with that relevant passport office. However, by my experience the chances are small that they do have any records left. Good luck.